Lead-calcium batteries deliver more power per pound than competitive dual-purpose batteries. They feature a no-spill design that allows you to heel over to angles up to 45°. The exclusive molded-in stainless steel studs and hex nut terminals make connections easy, while protecting against corrosion and failure. 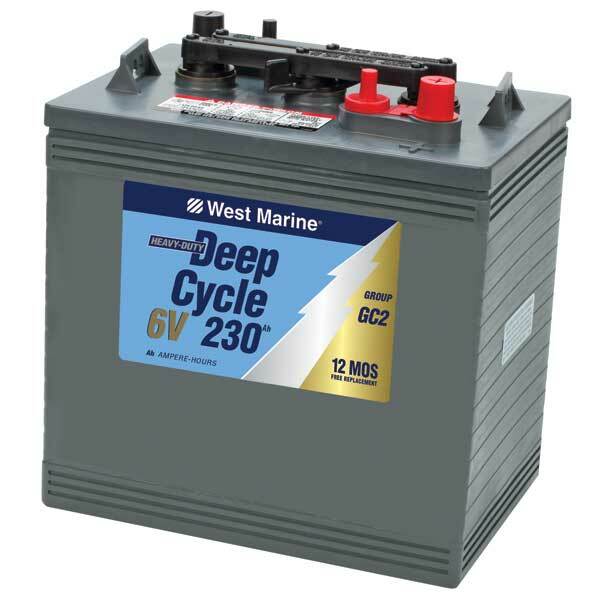 Manufactured in the U.S. for West Marine by East Penn, one of the most reputable battery companies in the country. Each battery receives over 250 quality control checks to guarantee consistent and superior performance. East Penn’s award winning factory leads the industry in closed loop and sustainable practices. Nearly all of the plastics, lead and acid are recycled, so our batteries are great for your boat and the environment. Core charge will apply to battery purchase if an old 6V battery is not exchanged at the time of purchase. WARNING: Battery posts, terminals and related accessories contain lead and lead compounds, chemicals known to the State of California to cause cancer and reproductive harm. Batteries also contain other chemicals known to the State of California to cause cancer. Wash hands after handling. For more information, go to www.P65Warnings.ca.gov.